Product prices and availability are accurate as of 2019-01-13 13:28:52 EST and are subject to change. Any price and availability information displayed on http://www.amazon.com/ at the time of purchase will apply to the purchase of this product. Milling Machine Belt Cover . These Unique Patented Belt Covers Are Made Of Durable Cast Aluminum. The Hinged Covers Are Sold In Pairs For The Right And Left Sides And Are Permanently Attached To The Machine. 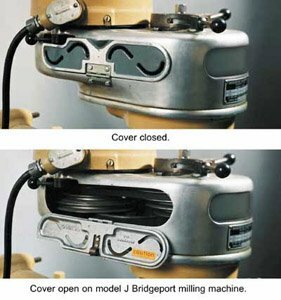 Spindle Speed Changes Are Done Quickly And Efficiently By Simply Putting Down The Belt Cover. OSHA Requires Under 29 CFR 1910.219 That All Mechanical Power-Transmission Apparatuses On Machinery That Creates A Hazard Be Covered Up To Meet This Requirement. Model No. 13265, Milling Machine Belt Covers With Hinges.